From The Homes, Haunts, and Battlefields of the Covenanters. The martyrs in question, who were among many of that profession in these years, were executed by a condemned fellow-Covenanter who days before in Ayr had miserably consented to turn hangman in order to save his own life. We’ve previously covered that tragedy in these pages. Erected by Friends to Religious Liberty -31st Dec. 1823. At Spoleto, under the Emperor Maximian, the holy martyrs Sabinus, bishop of that see; the deacons Exuperantius and Marcellus, and the President Venustian along with his wife and children. Marcellus and Exuperantius were first racked then heavily cudgelled, then mangled with hooks, and their sides were afterwards burnt until they died. Venustian and his wife and children were shortly afterward put to the sword; holy Sabinus had his hands cut off, and was long imprisoned, and at length lashed to death. These did not all suffer at the same time, but they are all commemorated upon the same day. At Alexandria, the holy martyrs Mansuetus, Severus, Appian, Donatus, Honorius and their companions. From Yemen Divided: The Story of a Failed State in South Arabia concerning the juridical follow-up to the ouster of Ali Nasir Muhammad during the a civil war in South Yemen referred to as the Events of ’86. This breakdown of order in the People’s Democratic Republic of Yemen (PDRY) would set the stage for its eventual 1990 unification with North Yemen. There was a relentless propaganda campaign against Ali Nasir and his associates, especially Muhammad Ali Ahmad. The main leaders were put on trial in open court in the presence of television cameras and the media. For a while it was compulsive viewing, as hundreds of witnesses testified in a unique experiment. As the process dragged on, however, the leaders became increasingly uncomfortable. The desire for revenge in early 1986 had been replaced by a need by mid 1987 to heal wounds. They now wanted to persuade Ali Nasir’s followers to return to the PDRY and cooperate with the new regime. In March 1987, for example, [Haidar Abu Bakr] al-Attas said that, of the 5,000 who had been arrested in early 1986, only 200 were still being held, of whom 94 were on trial in Aden and 48 were being tried in absentia. Later in the year, a general amnesty was declared for people who returned to the PDRY by the end of the year — subsequently extended to July 1987. Throughout this period, Ali Nasir (by now living in Syria) offered negotiations, which were scorned, but also sent operatives over the border in Shabwa and Abyan to stir up trouble. There was also a steady stream of defections to his headquarters in Ta’izz, not far from the PDRY border. The trials were concluded in December 1987, and on 27 December the Politburo ratified death sentences on Ali Nasir, Muhammad Ali Ahmad, Ahmad Musa’id Husain, Abdullah Salih Ulaywa, Ahmad Abdullah al-Hassani, Abd Rabbuh Mansur Hadi (now president of the Republic of Yemen), Faruq Ali Ahmad, Alawi Husain Farhan (former deputy minister of state security), Hadi Ahmad Nasir (former YSP Secretary for Aden), Ahmad Husain Musa and Mubarak Salim Ahmad. It commuted sentences passed on another 24 to 15 years in prison (including Muhammad Abdullah al-Battani and Sulaiman Nasir Muhammad), and it reduced a sentence of 15 years imposed on al-Tali’a leader Anis Hassan Yahva to seven years. Others were given lengthy sentences. Five were executed on 29 December: Faruq Ali Ahmad, Hadi Ahmad Nasir, Alawi Husain Farhan, Ahmad Husain Musa (a former commander of the air force) and Mubarak Salim Ahmad (commander of Ali Nasir’s bodyguards). The executions led to outrage in the north and parts of the PDRY, as well as the wider Arab world. A shocked [Ali Salem] al-Bidh remained firm, but al-Attas and others argued that the remaining prisoners should be treated with leniency. Over the next two years, many of those in prison were released or pardoned. On the morning of the 27th December the following malefactors were executed in the Old Bailey, viz., Richard Carrol, a blind man, for breaking open the house of John Short, in the parish of St. Botolph, Aldgate and, and stealing a quantity of wearing apparel, &c.; George Roberts, for assaulting Benjamin Morgan on the highway near Finchley, and robbing him of one guinea and some silver; and Thomas Kennedy, for stealing a quantity of silver buckles, plate, jewels, and other goods, to the amount of 100 l. in the dwelling-house of Richard King, where he was shop man. They all behaved very penitent. There have been 105 persons executed from the 12th December, 1786, to the 11th December, 1787, only 24 of which number have been reported to be buried as such within the Bills of Mortality. Clipping found in the prison journal of 19th century Newgate Ordinary Horace Cotton — beside the handwritten notation, “105 executed in one year”. The Old Bailey was in use at this time as a venue for conducting executions as well as pronouncing them, following the end of the Tyburn tree in 1783. A temporary gallows in the central courtyard of the Old Bailey served the purpose, with the hanging conducted using the classic “turn the man off the cart and let him strangle” technique. London Morning Herald, Jan. 1, 1788. The blind(?) man was also reputed to be oddly adept at playing cards. At the Fayetteville (Arks.) Court on the 8th inst., John Burnett was sentenced to be hung on the 26th inst., for the murder of Jonathan Selby. John Burnett, the son and collaborator of murderers Lavinia and Crawford Burnett — a case we addressed in a previous post — belatedly shared his parents’ fate on this date in 1845. On this date in 1973, the government of Mohammed Daoud Khan — himself freshly installed as the first Afghan president, after deposing his cousin, the king, in a July 1973 coup — had five alleged conspirators executed. Radio Kabul announces the discovery of an allegedly Pakistan-backed plot to overthrow the new regime. A number of civilians and high-ranking military personalities are arrested, including former Prime Minister Mohammad Hashim Maiwandwal, who is later reported to have hanged himself on October 1 while awaiting trial. Five defendants are subsequently condemned to death and executed on December 25, while others receive long terms of imprisonment. A second attempted coup is foiled in December. The Kabul press accuses Pakistan of fomenting these conspiracies, but no solid evidence for the accusation is forthcoming. In view of Pakistani Prime Minister Zulfikar Ali Bhutto‘s desire for friendly relations with Afghanistan, it seems more likely that the conspiracies were the products of domestic discontent. Mohammed Daoud Khan was successfully overthrown in 1978 by a Communist … setting in motion the sequence of events that would unleash the bloody Soviet-Afghan War. On this date in 1328, Willem de Deken, burgomaster of Bruges, had his hands cut off and his neck strung up in Paris for treason. Belgian illustrator Jean-Leon Heuns‘s 20th century depiction of Willem de Deken. De Deken was among the leaders of the 1323-1328 Revolt of Coastal Flanders. “As with most rebellions in Flanders, the revolt was not a straightforward clash of social classes,” notes Medieval Bruges: c. 850-1550. 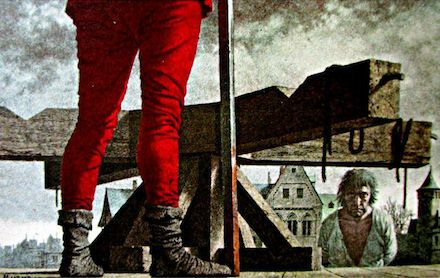 At first, the protests of the rebels of the castellany of Bruges and other rural districts in coastal Flanders were aimed at the abuses in tax collection by the ruling elites — and more specifically members of the castellany’s noblemen who were thought to be exploiting the commoners to line their own pockets … However, the rising was soon joined by a Bruges coalition of artisans and some disgruntled members of the city’s commercial elite. 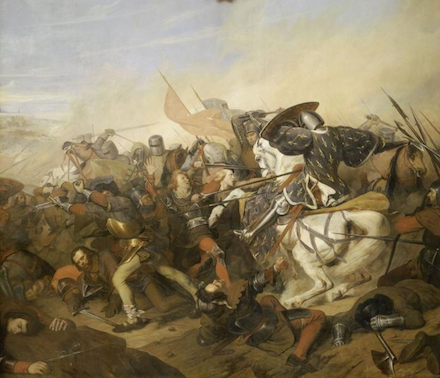 The rising’s scale brought in the intervention Louis’s French allies,* and the French finally brought Flanders to heel at the Battle of Cassel on August 23, 1328. ** De Deken did not have the good sense of his peasant rebel counterpart Nicolaas Zannekin to die at this battle. The Battle of Cassel, by Hendrik Scheffer (1837). This was all bad news for the men and women in rebellion in the 1320s but triumph on the Cassel battlefield could not resolve a fundamental contradiction in the Low Countries between Flemish merchants, whose booming wool trade pulled them ever closer to the English cloth industry, and the French-facing political alignment of Count Louis. * Times being what they were, French intervention also entailed having the Avignon Pope John XXII pronounce a sacramental interdict against Flanders pending its submission. ** It’s one of several battles of Cassel in northern France, further muddled by several battles of the unrelated but homophonic Cassel/Kassel in Hesse. 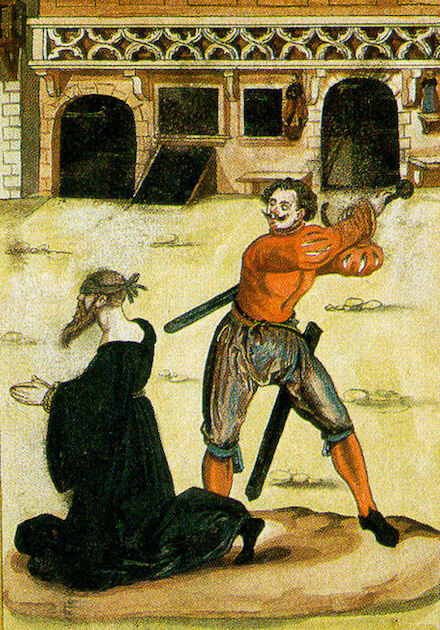 On this date in 1572, Antitrinitarian Calvinist Johann Sylvan lost his head in a Heidelberg market. Sylvan — or Johannes Slyvanus — was a pastor and theologian in the service of Calvinist Elector Frederick III. Frederick’s own Calvinist scruples were theoretically anathema in a Holy Roman Empire whose writ of tolerance did not extend past Lutheranism. But Sylvan gravitated towards a circle of reformers whose concept of the divine left orthodox Calvinism far behind — “a group of ministers within the Palatine church, who were not only prepared to deny the eternal divinity of Christ, but secretly aspired to promote a further reformation of received doctrine with a view to restoring the pristine monotheism of the faith,” according to this pdf volume, The Heidelberg Antitrinitarians. This rejection of the long-canonical Christian mystery of threefold godhead formed a recurring subtheme of Europe’s Reformations, its exponents — like Michael Servetus — forever prone to martyrdoms administered by any respectable sect. This proved to be the case for Sylvan as well; given his dubious theological position within the empire, Elector Frederick might have felt it politically necessary to come down hard on these radicals. Still, while Sylvan was made the example, others in his Antitrinitarian circle lived to expound their heresies in other lands. Matthias Vehe fled to Transylvania — where a Unitarian Church was founded in 1568, protected by a sympathetic prince — and then to other fellow-travelers in Poland. Adam Neuser also escaped, later converting to Islam and defecting to Ottoman Istanbul, an event that did a lot of lifting for anti-Anti-trinitarian propagandists. — Henry Wilson, convicted of murder, hanging, New York. Executed December 22, 1865 A career burglar, Wilson was executed for slaying of Henry DeVoe, whose home he had been robbing. Wilson admitted to killing two other New Yorkers — Burr Burton in Syracuse and Mrs. Lewis in Lancaster — and told police he was the man wanted for a host of unsolved crimes. He went to the gallows three days before Christmas. A reporter for the Rochester Democrat censored Wilson’s profanities, which appear to be derivations of damn.